J-hook holdback for curtains and draperies. 6 1/2 inch length by 4 5/8 inch width Made of steel tubing. Some colors are more than base price. Drapery double rods. White finish. Super heavy duty combination traverse and valance rods. Projects 2 3/4 to 4 1/2 and 5 1/2 inch on valance, clearance 2 to 3 1/2 inches traverse. Includes cord tension pulley. Graber super heavy duty features include a universal front loading end bracket, metal adjustable and reversible master carriers ball bearing end pulleys, a spring loaded side gate for adding or removing slides, molded, canted slides, can be converted to one way draw, scored center support base for easy mounting on narrow casings, universal cam lock stirrup, braided polyester cord, and angled tip on overlap arm. Swing arm curtain rods 3/4" diameter adjusts to 35 7/8"
Adjustable from 24" to 35 7/8". Includes swing arm curtain rod, bracket and finial. Full 180 degree rotation. Use this swing arm rod to cover an area you need to move curtains away from window for access or any area you need easy access. 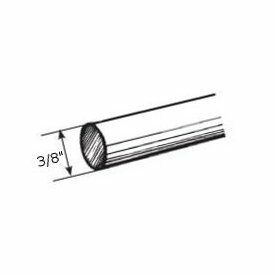 13.536: Swing arm curtain rods 3/4" diameter adjusts to 25 3/4"
Two way draw, includes 10 slides. Curtain rod hardware for the budget minded. Empire Traverse Rods are made from heavy guage steel with a baked enamel finish. Quick mounting drop in brackets and supports that fit over rod are included. Cord guide is included to hold cord to wall. The Empire rod has self lubricating pulleys and slides.Polyester cor and continuous lacing for use at either end or to convert to one way draw. A perfect draperies rod for light applications. Brass drapery rods require cleaning, Alexandria gives you the brass look without the messy cleaning. Rods are metal, slides and finials are plastic. See our installing curtain rods in the support section. Projection 3 1/2 to 4 1/2 inches. by Graber. 1-624-8: Alexandria , decorative curtain rods, crown finial 84-156"
Use with the 9-400 series curtain track. Graber product. White finish. Spring pressure rod 8" -11"
Drapery tension rods. Spring tension window rod for inside sash mounting. Tension curtain rods by Kirsch. Two spring tension rods per pack on this size. R700-025: Spring tension curtain rods 16"-24"
For 2 1/2" Continental II. White finish. Wire twist rings for curtain rod for 1 inch pole. 1 1/2 inch inside diameter by 2 1/8 inch outside diameter. Some colors are more than base price. Order in 16 foot increments. Extruded aluminum, white finish. Price break 128 feet. . Cord draw, ceiling or wall mount. For pinch pleat or Ripplefold systems. Architrac Series 94001.